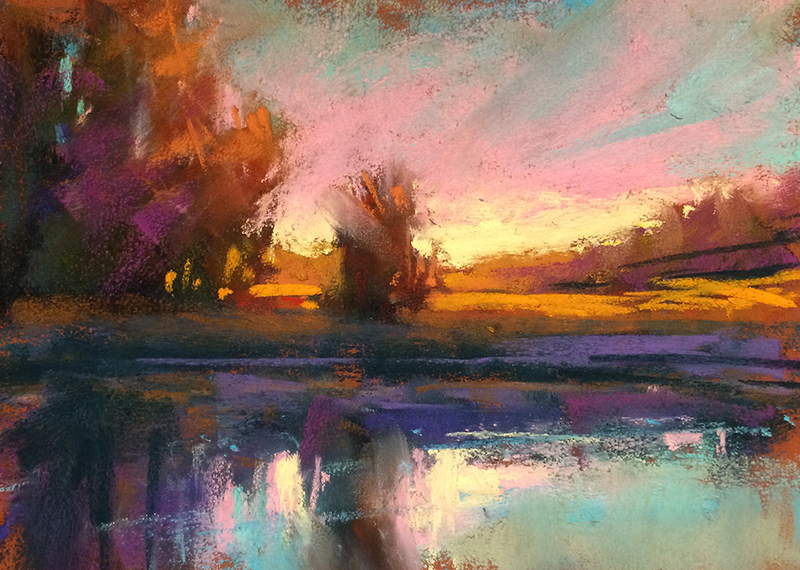 This small pastel, 4’x6′ is a study of a place very familiar to me. I recently returned to Mollala State Park with a good friend who was keen on seeing the nooks and crannies of the park, something I’d not done when I’d been there in the past. I was at a different time in my life then; young kids, dogs, bicycles. I was preoccupied! Glad to be returning to get another point of view of the park and take it in from a new ( but older), perspective. It was a more mysterious and not surprisingly, quieter place than I’d remembered with hidden beauties and richly textured paths; a good place for contemplation and devotion. The little painting speaks directly to me of this. When I’m painting, I’m trying to say things simply, quietly, directly. Not over-thinking, nor just flailing around, I hope! I want it to be an image that is as if you were simply there, not searching or looking, just seeing and feeling the place. i know i've said it before, but it is just such a joy to watch the way you paint….always makes me think of it more like you are dancing with the material! so much wonderful information in your videos….and again, i am very grateful to you for your generous spirit Marla! I love watching you demo Marla….it's like magic happening right before our eyes! thank you! This is my first time that I am visiting here and I’m truly pleasurable to see everything at one place.